If you have prediabetes or diabetes, you likely know that what and how much you eat plays a big role in helping to manage your blood sugar. Sorting out carbs, protein, and fat can certainly be a challenge, especially with what seems like a lot of conflicting advice out there. However, what you may not be as attuned to is the way you eat. We all have habits around food, and because we eat a certain way for so long, we might not realize that some of these habits aren’t doing us any favors. So, along with counting those carbs, take a closer look at how — and when — you’re eating and decide if some changes are in order! Large plates, bowls, and glasses. Hey, if we’re going to eat supersized portions of foods, we need dishes to accommodate them, right? But have you checked out the size of your dinner plate lately? Compare it to a plate that your mother or grandmother used to use. You might be surprised at the difference. In the 1960s, dinner plates were about 9 inches in diameter. Today, they’re closer to 12 inches. And yes, those 3 inches do make a big difference in how much you eat. Bowls and drinking glasses are larger, too. The larger the dish/glass, the more you’re likely to eat or drink. Action step: Eat from smaller dishes and bowls. Unless you’re drinking water, use a smaller glass for beverages. Nighttime nibbling. 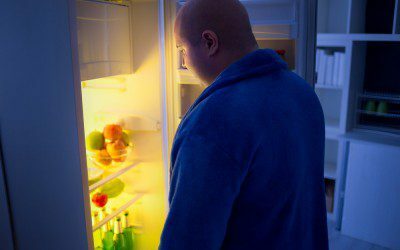 Eating at night isn’t necessarily a bad thing, but if you’ve eaten breakfast, lunch, and a healthy dinner and find yourself heading to the fridge all night, it’s time to apply the brakes. Many people have an evening routine of eating dinner and then turning on the television, tablet, or laptop — it’s how they relax and unwind. And what better way to add to that by having a snack, right? Nighttime calories count, though, and they can quickly add up if you’re not paying attention. Weight gain and higher blood sugars in the morning are often the result of mindless nighttime eating. Action steps: In many cases, eating a planned snack at night is fine. It’s the constant back and forth to the kitchen that can spell trouble. One way around this is to brush your teeth after dinner and tell yourself that the kitchen is closed. If you really have a craving, wait it out for about 10 minutes; if that craving doesn’t subside, reach for a healthy treat, like a piece of fruit, some raw veggies, or a small handful of nuts. Also, fix yourself a cup of hot decaf or herbal tea instead of foraging for food. Emotional eating. Stress, anxiousness, sadness, and boredom are emotions that can negatively affect your health. We all experience these emotions at one time or another. But when they’re a constant part of your life, it’s not uncommon to turn to food and eating as a way to help combat them. Eating and emotions are closely tied; if you’re always turning to food as a source of comfort or as a way to keep you from dealing with unpleasant situations, you can very easily form a habit that isn’t so easy to break. In fact, you may find yourself in a vicious cycle: eating raises your blood sugar or your weight, which gets you upset, which leads you to eat even more. Action steps: Take back control. One way to do this is to keep track of what and when you eat. Look for patterns that link your food intake with your mood. Think of ways to break the food–mood connection: practicing deep breathing or yoga, going for a walk, journaling, or calling a friend, for example. Come up with your own list. Also, listen closely to your body. When you find yourself headed to the kitchen, ask yourself if you’re really hungry. If you’re not, wait it out. Often, cravings will pass. Try not to keep tempting goodies around. If you know they’re there, you’ll go for them. 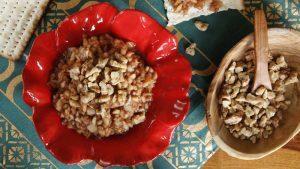 If you need to crunch on something, go for raw veggies, popcorn, or rice cakes. And if you find yourself really struggling with emotional eating, seek out professional guidance. Eating too fast. If you’re wolfing down a bowl of cereal while practically running out the door, or you’ve finished dinner before others have started to eat, you’re eating too quickly. Busy schedules and even growing up in a large family can often lead to rushed eating. The downside? You don’t give your brain a chance to register that you’ve had enough to eat. Fast eating can also lead to heartburn and upset stomach. Not surprisingly, research shows that fast eating is linked with being overweight. Action steps: Put your fork down and take a sip of water between bites. Also, take smaller bites of food and chew your food thoroughly. It can also help to set a timer for 20 minutes (roughly the amount of time it takes to start to feel full) and pace your eating to match that duration. All habits take time to form — and to break. Give yourself some time to work on them. Also, be strategic — stock your fridge with healthy food, clean out your cupboards, invest in some smaller plates, allow more time to eat your meals, or sign up for a yoga class to better cope with stress. Be patient and persevere: Your hard work will pay off! Can frozen treats have a place in the diets of people with diabetes? Is frozen yogurt really healthier than ice cream? What is the key to blood sugar and weight control when it comes to dessert? Bookmark DiabetesSelfManagement.com and tune in tomorrow to find out!